Electronic devises take so much of people's attention today. When I was a nipper, we had tangible things in front of us, like real cards and board games that came out of boxes. Of course, if the weather was good we were outside playing sport or exploring the open land behind where we lived. However, poor weather brought us inside and we played those games. My better half and I are increasingly turning to such for entertainment. There is something nice about playing with people you know and care about. 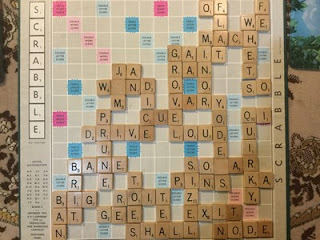 We enjoy Scrabble, something that a few friends we know are avid players of. We do it for fun, brain exercise and bonding together. Have you got a board game or a pack of cards? Give it a go and remember, win or lose it's just a game. Who you play with is more important than the outcome. If you want a Scrabble online dictionary, we use Collins Scrabble. The game we played here used all the counters but I have just noticed one of my wife's words has been put down wrongly. Note to self, 'Better surveillance required in future'. All the words you see there are acceptable (except one, lol) and we have fun playing it. If looked after, games can last indefinitely. This particular set is so old it has wooden pieces and racks to hold the words.